Getting Lc. Tropical Pointer 'Cheetah' to bloom? I have a Lc. Tropical Pointer 'Cheetah' that I have been growing for probably 3 or 4 years now. It seems to have reached maximum height, with new growths consistently 6 to 8 inches tall, multiple leads, probably 30 to 40 pseudobulbs, an insanely large number of roots - and it has never bloomed. I have always grown it with my other Catts (same light, etc.) which seem to bloom with no difficulty. Any ideas why this plant may not be blooming? Does it require higher light than other Catts? What should its bloom season be? I will say that the plant has significantly outgrown its current pot. I was hoping for at least one bloom before repotting and dividing it. Prior to giving it away to a fellow club member...I grew mine right along w/my other catts. I did nothing special for it and it reliably bloomed 2x a year. She is growing it along w/her other catts (also no special anything) and she is getting the same growth and blooming. You must just have a shy one. sunshine and Catt Mandu like this. Wow that is really odd. I am guessing by the number of pbulbs is almost a specimen size plant and should be putting on a real nice show. You can always try a little more light. Love the freckles and color so I can see why you got it. I found this on the Carter and Holmes website care sheet. 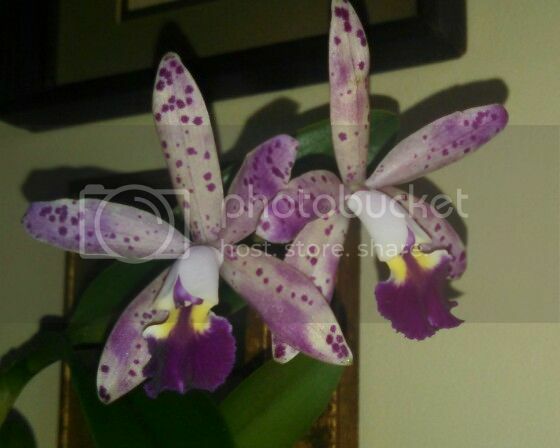 Keep in mind large standard cattleya require a night time drop in temps to promote flowering their season. If you keep your thermostat the same year round, day and night, your cattleya may not bloom. Even tho it's not a standard size catt it may need that temp drop to stimulate and signal it's blooming time. You can try the temp drop as I don't think it would hurt anything worth a try. Catt Mandu and gingerhill like this. This Catt did experience a temperature drop along with many of my other plants - probably nights in the mid to low 40s F before I brought it indoors. This is fairly typical practice for me each fall, too. From the SBOE link, it is good to know that the plant typically blooms in October (but per Katrina's advice, also can bloom a couple times a year). Under my fluorescent lights, the new growths on this plant are getting enough light to get some red coloration. I'm hoping that more light may help(?) Possibly next summer, I will acclimate it to light that is somewhere between Cymbidium and Brassavola light. If we have warm spells in the winter (which happens here in Georgia) I may place it outdoors in the sun with the Cymbidiums for a few days at a time. The plant is currently over-growing two sides of a 4-inch diameter pot (probably hanging 3 inches off of opposite sites of the pot). I was thinking of repotting/ transferring it in the winter or next spring to a rectangular Bonsai pot that is maybe 11 or 12 inches long. The re-pot will unavoidably damage some roots, though. What do you think? Leave it alone until it blooms? Or try the re-pot, hoping that might nudge it into blooming? sunshine and gingerhill like this. Last edited by Catt Mandu; 12-07-2015 at 10:04 AM. Well, all the comments and advice have convinced me to hold on and keep trying. At least another year. I still don't quite understand why I've been able to bring other Catts from near oblivion to blooming well, while this one has always seemed healthy, but never flowered. Maybe threats will work - there's a farm nearby with goats; if it hasn't bloomed by next October, it gets tossed over the fence. Or maybe it becomes an outdoor Christmas ornament. I have a highland maxima alba that is overgrowing an 8" pot and this is the first year I've been able to coax a couple of blooms out of it. Now, keep in mind, I have other maximas and they are excellent and reliable bloomers but this alba is a PITA. I put it in nearly full sun (even afternoon sun) this past summer...it was so bright the damn thing developed dark patches on his leaves (like a tan) and yet...2 measly flowers. The flowers are gorgeous but seriously?...2 flowers on a plant that's so large? One of my young maximas is in a 4" pot and it's first bloom ever produced 2 flowers this year. I have zero trouble w/any of my other maximas but this one just doesn't want to bloom. It's a mystery. Also, I frequently have/hear discussions between members at my OS over how someone can get plant X to bloom but someone else can't and yet they are growing their X just like or very nearly the same as the person getting it to bloom. Or, they can't get X to bloom but Y and Z are blooming just fine. Kind of like what you're talking about w/your other catts blooming just fine. I guess what I'm trying to get at here (albeit a very long road taken) is that I believe some plants just won't/don't bloom well. No matter what we do. And this is even more true when dealing w/complex hybrids that could have taken on who knows what from which parent. You can have 2 of the same plant and sometimes one just doesn't perform as well as the other. And there is no rhyme or reason for it. AT least not obvious reason. My reluctant maxima is going to be divided when it's done blooming and I'm hoping it will shock it into performing better. If not, at least I'll have more space. Personally, I wouldn't hesitate to move it to a larger pot if it's showing active growth. What I do find odd is that 'Cheetah' is an awarded clone of this plant, so you'd think blooming would be better. There are so many leads on the plant that it is virtually always in active growth, so maybe the repot will become an evening project. I'll give it another year & if still no blooms - yeah, ranch dressing maybe, then toss it to the goats. katrina and gingerhill like this. Awww...you have goats? I love goats and if we ever manage to actually move out of the city limits I'd love to have a couple of pygmy goats. I know next to nothing about caring for them but I think they are absolutely adorable and I hear they make good pets. If we ever have the space and land...I'll have to work on the hubby though because I don't think he's too keen on my wanting goats. As for the catt...good luck w/it. Maybe a good dividing w/a sharp tool will teach it a lesson. The rougher the better. LOL! I think it may just need more light. Well, I don't have goats - but a neighbor nearby does . . . and I was kidding about feeding orchids to the goats . . . and the ranch dressing . . . mostly. @ Bolero - Thanks, I probably will try to gradually increase the light, especially when it is outdoors. Last edited by Catt Mandu; 12-09-2015 at 08:06 AM. Yea, I figured you were joking about feeding them but I thought maybe you had goats. Either way...goats are adorable. I can never think of goats without thinking of my graduate school room mate and a college friend of his from south Georgia. The friend was a farm kid. For a while, his family had a couple goats named 'Bah-ah-ahb' and 'Leh-eh-eh-ster' (make appropriate goat noises as you say Bob & Lester). These were full-sized adult goats. They were not exactly 'pet' material. Ornery, head-butted everyone, ate and chewed up stuff they were not supposed to. They were a full-blown, tag-team PITA to have around - either the goats had to go, or the family did. This being a south Georgia farm family, the goats eventually ended up as 'Bah-ah-ah-becue'! Yeah, if you want to have goats, you are wise to stick to the miniature ones or even pygmy goats. They are cute indeed, and probably easier to manage, especially if you can keep them away from the landscaping. Big goats - probably best managed as farm livestock. Yea, I've heard similar stories about the larger goats. I'd stick w/the pygmies...but I will definitely have to work on my husband should we eventually have the required space/land. Katrina: Selling points to your husband when you are considering getting a goat. Big advantage with goats or other herbivores vs. cats & dogs: All 3 kinds of animals produce "poo", but because goats are herbivores, the goat manure has less odor. Also, composted goat manure may be OK for the garden. From a 'mess' standpoint, goat waste should be much easier to manage. I suspect a vegetable-based feed will be cheaper than dog chow too. When I spent a summer in the Netherlands, there were these very small goats all around where I was living (it was an agricultural area). I have never seen such small goats here in the US, at least not at our state fair and the county fairs. If they do exist here in the US, they would be just perfect. I was told that they did a nice job keeping the yards mowed. I also think the little goats are so cute. we visited a petting zoo once where they had them. I tried to talk my husband into getting a couple, but he had no desire to try to rig a fence that they couldn't crawl under or worm their way through. As to the orchid, In my short experience, I have found that sometimes a repot into fresh medium will sometimes initiate a spike after a few weeks. HA! It won't be a selling point for him. I am the gardener in the family and he couldn't care less what I use for fertilizer. We do till in a manure compost mix but other than knowing what I want him to buy...he doesn't care so that wouldn't work as a selling point. No, I'll have to come up w/something else but, truth be told, he may be saying no right now but he usually gives in to things that I want. If we have the land and the situation is good for having goats then I likely won't have to whine all that much to get what I want. He's a big softie when it comes to me. How do you think it is that I have 300+ orchids growing in our living room/dining room and much of the accommodations have been built (as least in part) by him. As for the dogs and cats...we'll have those too. We'll never have 7 of the 4-legged furry kids running around the house at the same time again but we'll always have at least a couple of them. With dogs and goats, just remember their respective places on the food chain - or you could end up with a heartbreaking mess on your hands. Separate living space - or the goat needs to be large enough to defend itself with no trouble, especially if it is outnumbered. Seriously. This is why my kids never had guinea pigs when we already had dogs. HA! Some dogs refuse to go along w/that whole food chain protocol. Our 2 Newfs have been ruled by the cats. As were the Black Russian Terrier and our Shep/Husky mix we had. It's not to say they couldn't have hurt the cats if they wanted...they just never wanted to. No lie, all the cats have always been boss. LOL! Good point though so not to worry...I know some dogs are like that (our neighbor's dog is a cat killer) but if a dog can't get along w/cats then they won't be in our house and I imagine if a cat is good then even small goats would be safe. Raise them to be around the smaller animals and to understand what's acceptable behavior and what isn't and there shouldn't be any trouble. I'd never take in a rescue that presented prey drive nor would I train a dog in a manner that would praise or reward those tendencies. Plus, it seems most of our dogs tend to be of the gentle giant breeds...like our big baby Newfs. If the time comes, I think we'll be good. Point taken re: the dogs, and FWIW, I agree with your judgement that Newfs will likely not be a problem. With our household and the prospect of Guinea pigs way back when, we have dachshunds, and they have an extremely strong prey drive for hunting "varmints". Anything in our back yard, ranging from snakes to mice, squirrels, even 'possums, was unsafe. We have a fenced yard, but occasionally get deer that jump the fence, & the dogs will corner the deer. I have heard of that w/dachshunds. HA! Little weiner dog chasing a deer out of the yard...the visual is hilarious to me but I have heard others say the same of that breed. Big dog bravado in a little doggie body. I had a terrier/beagle mix way back when I was in high school and he had a stronger "ratter" drive and would go after shrews and chipmunks and baby rabbits. My dad encouraged the ratter in him for those critters because they were the ones that would destroy our garden and my dad's prized daffodil bulbs. Sammy learned a dead chipmunk or shrew got him a big treat. I once saw a photo of a hunter posing with a bear recently killed (won't get into the hunt vs. not argument - I don't hunt but have no issues with those that do). Anyway, posing with the hunter & bear was a very proud female wiener dog. From the story with the photo, her job in the hunt was to follow the trail of the wounded bear and corner it. Dachshund - vs. bear. Bear never had a chance. I know from experience, Doxies are brave to a fault! Anyway, posing with the hunter & bear was a very proud female wiener dog. And I bet she/he was a super proud wiener dog. Lc. Tropical Pointer 'Cheetah'. Threats work?? Maybe threats work - the latest growth to mature seems to have a sheath! Next on the threat list is my Encyclia cordigera . . .
Oh well, happy holidays everyone. Well, quite a few months later, my problem child finally bloomed on a massively overgrown plant. Proof that threats work eventually! Not the best photo in the world, but I like the flowers. No fragrance though. sunshine, Carkin, Orchidgirl83 and 1 others like this. Glad it finally decided to cooperate!